I hope you all had a great weekend. Mine was good. I took Reagan to see the Jonas Brothers and Demi Lovato/Camp Rock concert here in San Antonio on Friday night. It was an awesome concert and we had a blast! The rest of the weekend was spent just hanging out at home watching sports and movies and playing with the kids. Didn't get a chance to do much crafting; and actually just kind of enjoyed being lazy and rather unproductive. 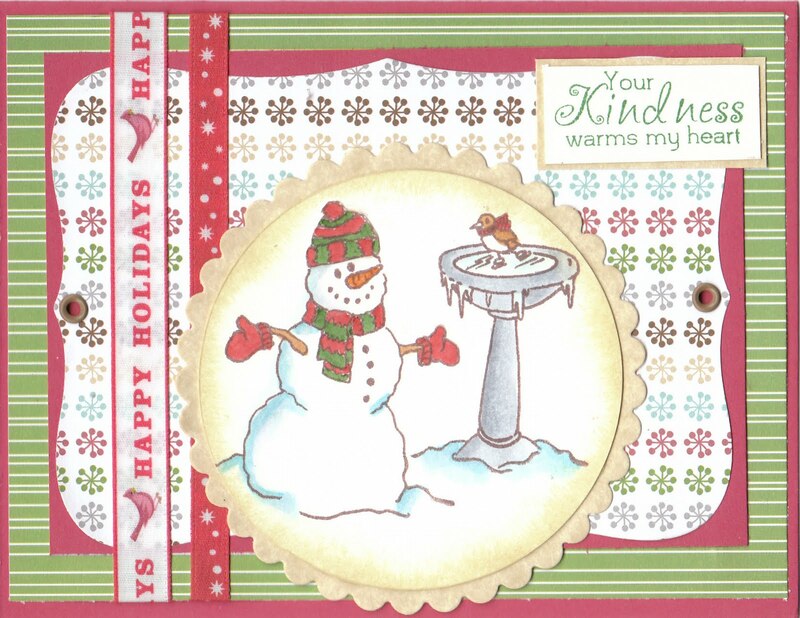 I put this card together this morning for Friday's OCL DT sketch challenge using papers from the "Merry Mint" Collection from American Crafts and Ruby Red Card stock. 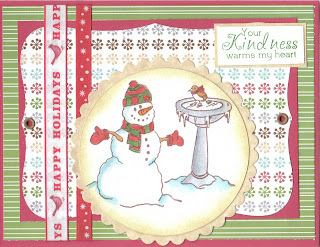 The stamp set I used is OCL's "Tweet Winter Wishes" I used stamped both of the images in Memento Rich Cocoa ink and then colored it in with Copics. E07, YG67 hat, mitten, scarves. B00, B02, C1 Snowman and snow. C1, C2, C5 Bird Bath. 2. Bah Humbug: Use your favorite medium. I love to color with Copics and really wish I had some more! What a sweeet version of the OCL sketch! Now .. kudos for your Jonas Bros. concert!!! Isn't it divine fun to actually "pariticipate" with our youth?! High Fives!! oooooooooooooh fab snowman image and a super card. Great snowman - thanks for joining in with the Christmas cards for Soldiers Challenge. Great card Dori, love the image and the sentiment is perfect for this card. What a gorgeous card. Your backing papers mix so well together and are fabby. Such a cute image I love the little robin!!!. So sweet, love your papers and coloring! How sweet!! I need to pull this set back out as I love it.